This article first appeared in City & Country, The Edge Malaysia Weekly, on April 23, 2018 - April 29, 2018. 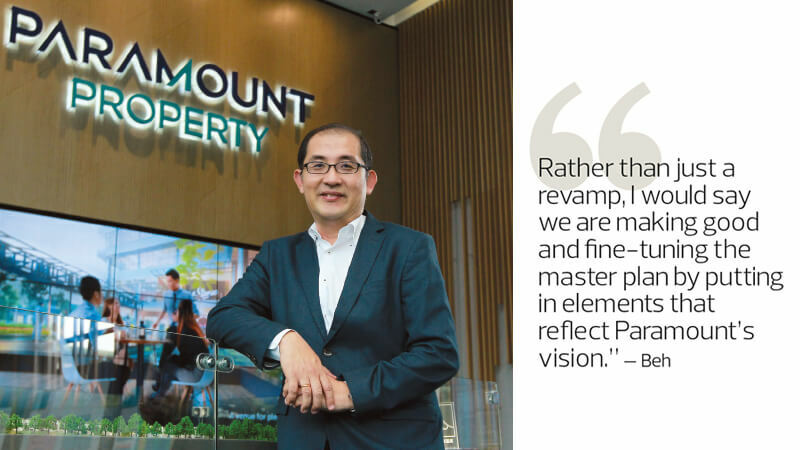 Paramount Property Sdn Bhd had to face two major challenges in developing its second township in the Klang Valley — Greenwoods in Salak Perdana, Sepang. The first was to revamp the original master plan by injecting elements that represent Paramount’s corporate vision. The second was the generally negative perception of the location, which is off the radar for most property investors. Sepang is deemed to be too distant and too quiet. CEO Beh Chun Chong tells City & Country that Greenwoods was part of an abandoned housing development, measuring more than 300 acres, that was started in the 1990s. About a decade ago, it was revived by a private developer, which delivered several hundred units. Paramount then bought over the remaining 237 acres of undeveloped land for RM22 psf, or a total of RM227.38 million, in 2014. “We saw potential in the land because it is not far away from KLIA, Cyberjaya and Putrajaya, and we knew that there would be high-speed rail and mass rapid transit in Putrajaya and hence, a good catchment for the area,” he explains. Paramount straightaway launched two projects there — 96 Residences and Belian — before it began work on revamping the master plan. Spanning nine acres, 96 Residences comprises 96 units of 2-storey linked homes on 20ft by 70ft lots. With prices starting at RM527,000, all have been sold and were handed over at the end of last year. Belian, meanwhile, is a commercial development of 2-storey shops, spread over six acres. The 47 shops have built-ups of 2,600 sq ft and above, and prices starting at RM811,200. To date, about 40% have been sold, and they will be handed over next quarter. 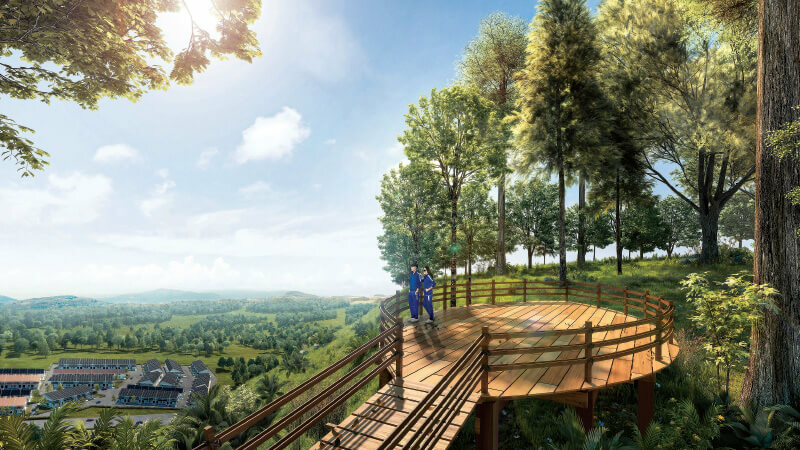 The freehold township, which was eventually named Greenwoods, has an estimated total gross development value (GDV) of RM1.1 billion and will be developed over 8 to 10 years. On completion, it will have 2,500 properties, including 2-storey linked homes, 2-storey terraced homes, strata homes, townhouses, shop apartments, commercial shops, schools and affordable housing. Paramount is planning facilities that will provide opportunities for families and friends to bond, such as parks, pocket farms, jogging tracks, cycling parks, hiking trails, a recreational pond and an interactive playground. Beh notes that “Greenwoods” means lots of trees and greenery, and adds that subsequent phases will all be named after wood species. The urban farm will be maintained by the developer and be open to the public, who can use the fruits, plants and spices there for cooking. Rainwater will be recycled for hydroponic planting while a nearby recreational pond will also serve as a retention pond. Beh explains, “We want to make it a real community, so it is an area for parents and children. When you are there, you will feel it is a very pleasant place. It is hard these days to find this kind of area — a place with hills and trees — in the Klang Valley. We want to maintain the natural setting. Our interactive playground will also be known as Discovery Playground as it will have equipment that is different from that found in conventional playgrounds. It is not just providing facilities but our contribution to the community so that people can come and enjoy. The developer’s efforts seem to be paying off. Its latest recent launch last month in the township, Phase 1 of Keranji, was fully sold. The 204 units of 2-storey terraced homes on 20ft by 65ft lots have built-ups of 1,775 sq ft and are priced at RM479,900. Ben notes that the buyers come from different parts of the Klang Valley, including Salak Perdana. The bulk of them are working adults below 40 who are looking for affodably priced landed homes. Keranji is the first residential launch under the new master plan. “It will have three phases and we are going to launch Phase 2 next quarter. Registration has started,” says Beh. Phase 2 will offer 254 two-storey terraced homes on 20ft by 70ft lots, with built-ups of 1,954 to 2,401 sq ft. Spread over 22.68 acres, it will have a GDV of RM113 million and is targeted at owner-occupiers, newlyweds and apartment dwellers who wish to upgrade. The Salak Tinggi KLIA Express station is 13 minutes from Greenwoods. Beh expects the distance to be cut down significantly with the completion of a new road connecting Kota Warisan to Bandar Baru Salak Tinggi in three years. The new road, known as the B20 route and currently under construction, is expected to reduce traffic congestion on the Putrajaya-Cyberjaya Expressway (FT29) and the Nilai-KLIA Highway (FT32) by 30%, and provide an alternative route to Bandar Baru Salak Tinggi for those travelling on FT29. Greenwoods is accessible via the North-South Expressway, Maju Expressway and North-South Expressway Central Link. Facilities nearby the township include Giant Nilai, KIP Mart, Mitsui Premium Outlet, Smart Reader Kids Kindergarten, KLIA Primary School, SK Taman Seroja, SMK Bandar Baru Salak Tinggi, East College of Technology, Inti Nilai International University and Xiamen University. Going forward, Beh is optimistic about the outlook for Salak Perdana as more developments are coming up and Sepang has seen rapid population growth in the past few years. He notes that the land price in the area has risen to RM30 psf. He says the company has built, among others, Utropolis and Kemuning Utama in the Klang Valley as well as Taman Patani Jaya and Bandar Laguna Merbok in Kedah. Paramount is also developing the 44.3-acre Utropolis Batu Kawan in Penang, anchored by the KDU Penang University College campus. Phase 1 consists of Sensasi Commercial Suites, with a total of 196 commercial and retail units, as well as Sensasi Residential Suites, with 612 units. To date, 87% of Phase 1 have been taken up. Construction has reached 50%. Phase 2, known as Suasana, comprises two serviced apartment blocks. The first tower, offering 491 units, was launched last month,and has since achieved sales of 60%. “With our experience in developing townships for almost 40 years, we are confident Greenwoods will also offer a master plan that will stand the test of time,” says Beh.